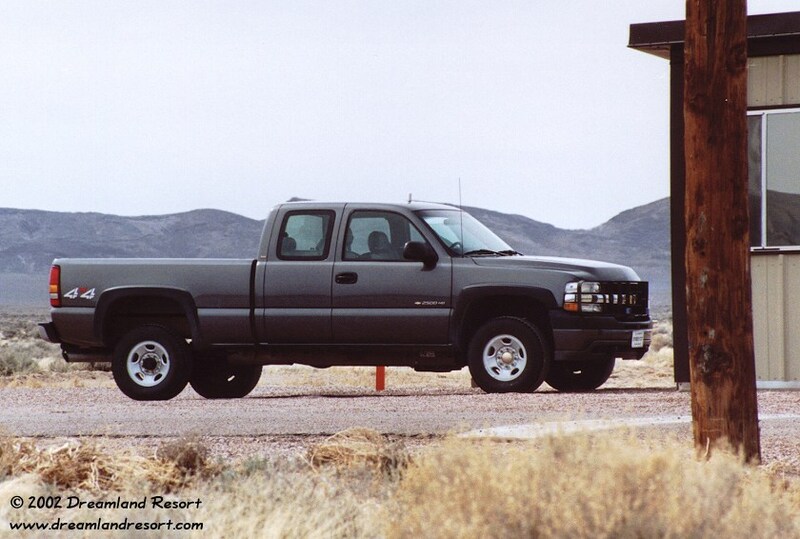 In late 2001, yet another new type of Cammo vehicle showed up: Dark gray Chevy 2500 4x4 Pickup Trucks, later also tan colored models. In early 2002 we saw the two vehicles shown below. Both are equipped with police-style red and blue signal lights in the grill, and reportedly a least some of the new trucks have a siren. 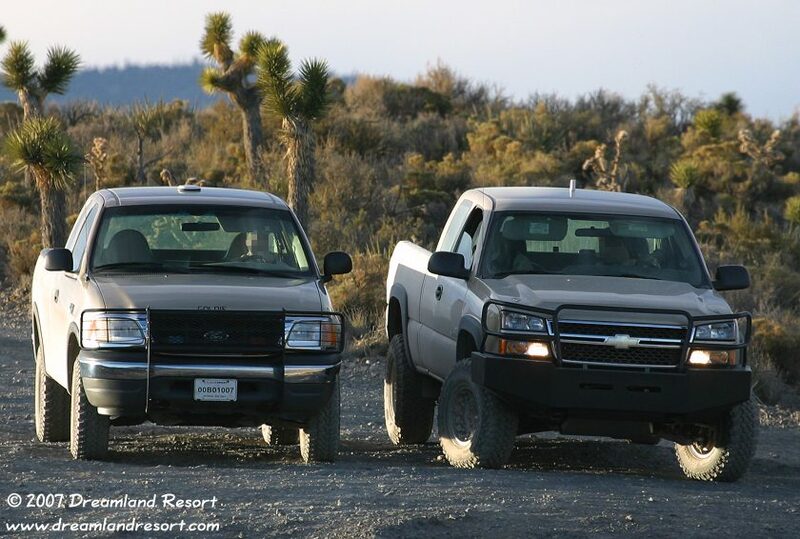 Today at least three different types of security vehicles are in service around Area 51: White Jeep Cherokees, Champagne Golden Ford F-150 pickup trucks and the new gray and tan Chevy 2500's. But the Chevy trucks are by far the most commonly seen. The second photo shows the new 400-MHz roof antenna for the digital trunking system used for radio communications by Area 51 security. It replaces the older flat disc roof antenna that can be seen in some of our F-150 photos. All new security vehicles are equipped with the new antenna, which probably has better performance in the mountainous terrain than the old disc antennas. The newer 2005 or later models (in the last three photos) are clearly better suited for the terrain. 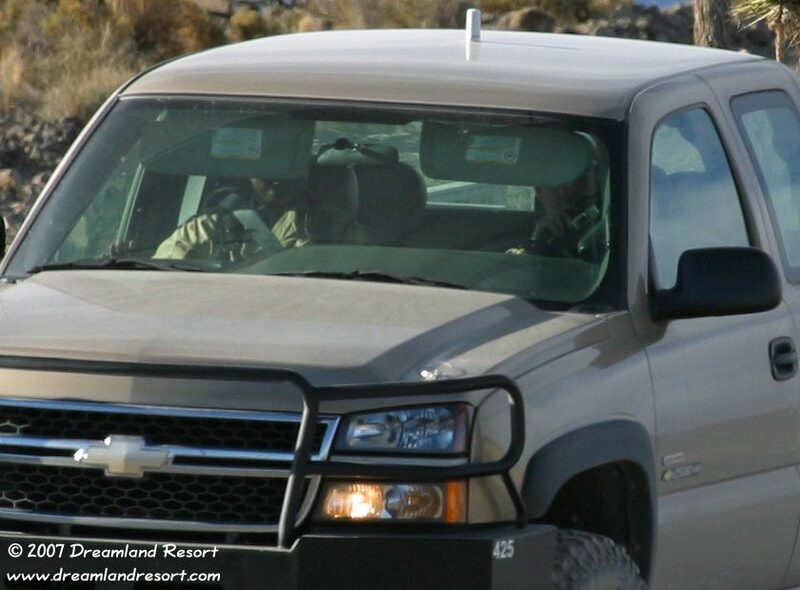 They appear to be the Light Service Support Vehicle (LSSV) option, built by AM General based on the Chevy Silverado 2500HD. They have a heavy-duty Duramax turbo diesel with Allison transmission. 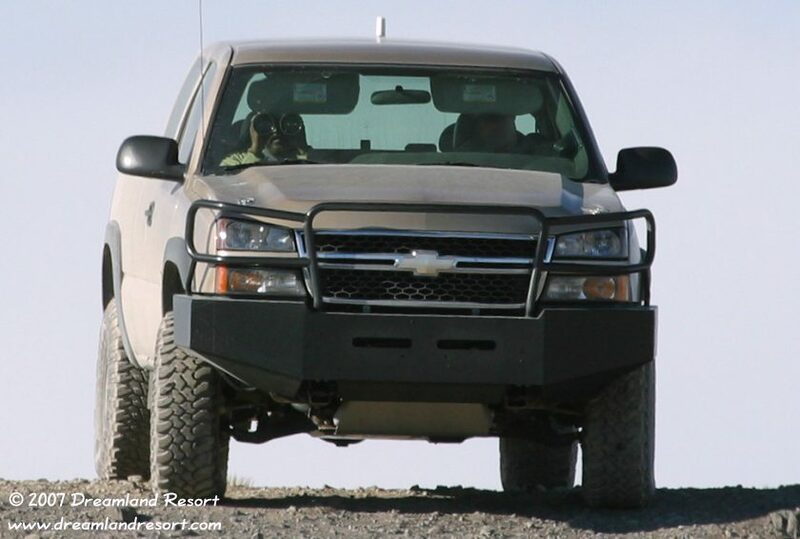 The heavy duty bumper with skid plates and the bead lock wheels indicate that they are equipped with the Enhanced Mobility Package (EMP) for heavy off-road use. 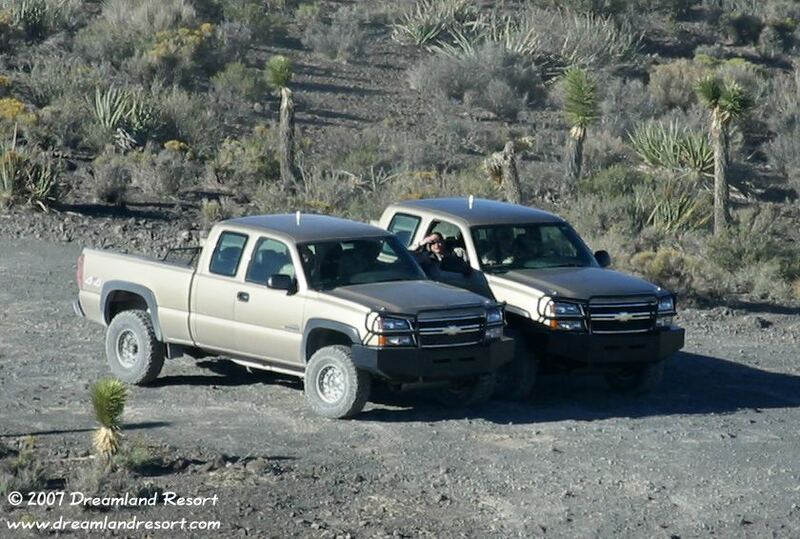 New toys for the boys: Brand new Chevy 2500 4x4 pickup truck. This one was seen on 4/5/2002 at the North Gate. 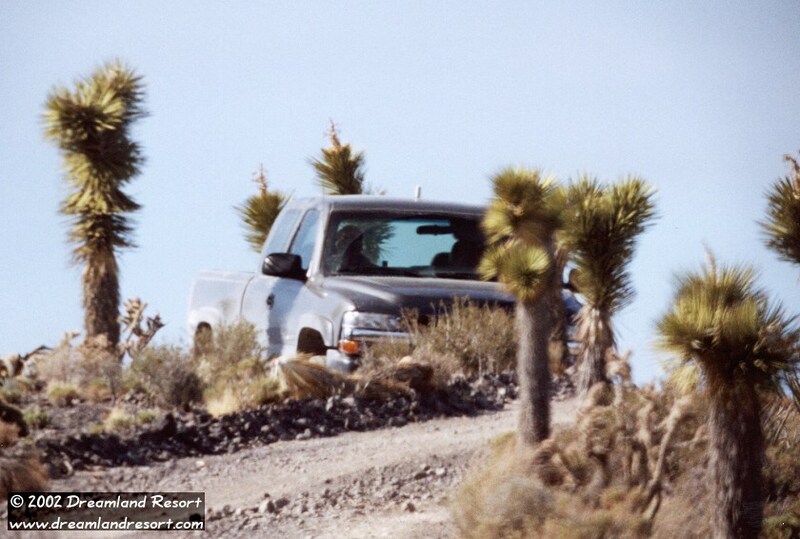 License plate "01B01721"
Camera-shy as usual, but the truck just wouldn't fit behind the Joshua tree. This photo taken on 4/7/2002 on Cammo Hill, near the Groom Lake Road signs. License plate "01B01716"
"... and I'm calling for backup!"